Reminder to make sure you have a representative for your church at the final briefing for the Whit Walk. Thursday 17th May 7.30pm at Rose Hill URC. Hear the latest and make sure you know where to be for when when the walk takes place on Bank Holiday Monday 28th May. 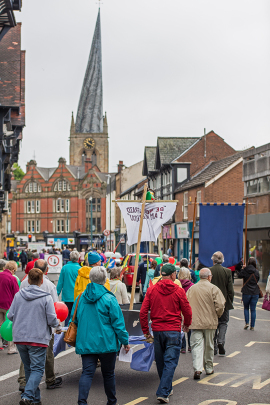 The procession is colourful, fun and bright, full of good news messages and a great witness to the town that the Church is very much alive in Chesterfield. Make sure you're a part of it!